Media and Contents: Hard cover with sturdy dust jacket; four hundred 8.5" x 11" (21.6 cm x 27.9 cm) pages printed on heavy glossy paper; approximately four hundred photographs, most previously unpublished; twenty-six color profile paintings. Advantages: Simultaneously provides historical perspective, day-to-day descriptions of unit engagements, moving personal accounts by pilots, and detailed coverage of aircraft subtypes, camouflage and markings. Many photo captions include comments on camouflage and markings. Very well written, translated and produced. Recommendation: Highly recommended for Luftwaffe modelers, aviation historians, and casual readers interested in World War II. JG 300 was a highly unusual Luftwaffe unit that pioneered the use of single-seat aircraft in night fighting, served subsequently for nine months as a front-line nightfighter Geschwader, and then converted quickly to dayfighting, playing a major role in Reich Defense during the final year of World War II. Its Messerschmitt 109 and Focke Wulf 190 aircraft wore a great variety of camouflage and markings that make them exceptionally attractive subjects for modelers. This Geschwader’s complex story obviously provides fertile ground for a book of potential interest to a broad audience. However, it also complicates an aspiring author’s task, not only because of the breadth of material to be covered, but also because the different expectations of modelers, historians and casual readers provide so much opportunity for disappointing at least one of these constituencies. Fortunately for all of us, Jean-Yves Lorant and Richard Goyat have met the challenge wonderfully well. 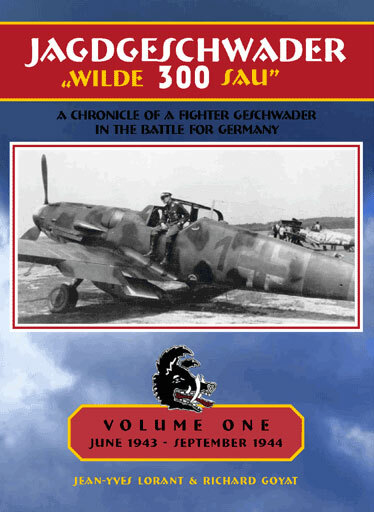 This superbly translated and produced 400-page volume is only the first half of an effort that may be expected to endure both as the definitive account of Jagdgeschwader 300 and as a benchmark for future Luftwaffe unit histories. (Volume Two is scheduled for release before the end of the year.) However, this book will be not only respected, but also loved, because it is an eminently readable — often downright exciting — work that manages simultaneously to provide historical perspective, day-to-day descriptions of unit engagements, moving personal accounts by pilots, and detailed coverage of aircraft subtypes, camouflage and markings. Its approximately four hundred photographs are well reproduced, though the image quality of a few is necessarily limited by that of the original prints or negatives. Most of these photos have not been published previously, and all are exceptionally well captioned, often with carefully-considered comments on camouflage and markings. The book is comprised of ten chapters that begin with a brief overview of nightfighting in the early phases of WW II, proceed through the foundation of Geschwader Hermann and its transformation into JG 300, and end four months after the unit’s conversion to the dayfighter role in May of 1944. The text and photos are complemented by an intriguing Introduction on the Luftwaffe’s criteria for acceptance of victory claims, numerous footnotes — more than a hundred in Chapter Ten alone! — that provide helpful detail without detracting from the flow of the narrative, twenty-six color profiles by Tom Tullis, two fly-leaf paintings by co-author Richard Goyat, seven appendices, and a detailed eight-page index. All of the color profiles are documented by photographs, and some of the camouflage and marking schemes that they portray are both surprising and spectacular. Eagle Editions is releasing decals for approximately half of these aircraft, the profiles of which can be seen at http://www.eagle-editions.com/decal88.htm , http://www.eagle-editions.com/decal89.htm and http://www.eagle-editions.com/decal90.htm . A marvelously successful example of multi-tasking, this book is highly recommended for Luftwaffe modelers, aviation historians, and casual readers interested in World War II.